Back in October I took a trip to Fruitlands in Harvard, MA, only about 40 minutes from my home. That visit sparked a long period of binge reading on the subject which is why, in the dead of winter, I’m only getting around to writing about that visit now. Having immersed myself in Louisa’s life over the past two and one half years, Fruitlands is pregnant with meaning. It’s a paradox – beautiful and open yet oppressive as I reflect on past events. In the summer of 1843, a new kind of family representing the hope of Utopia moved into the then red, ramshackle farmhouse nestled in a valley, at the end of a primitive and steep drive, deliberately isolated from the outside world. 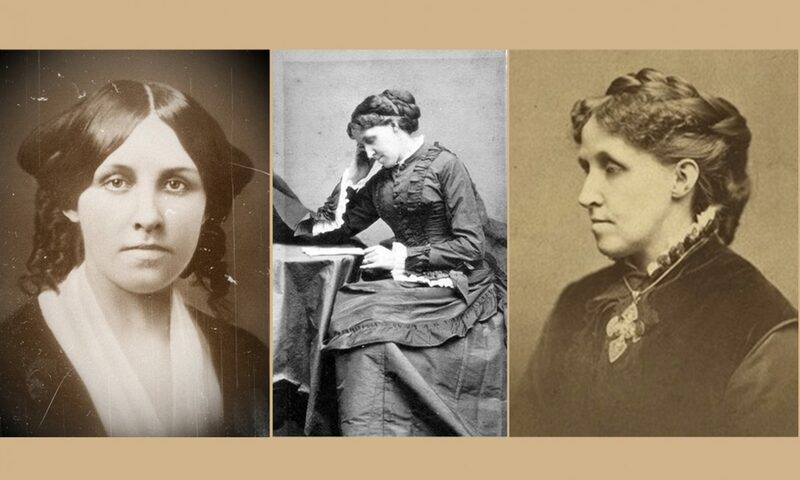 Accompanying Bronson Alcott and wife Abba were their daughters: Anna, Louisa, Elizabeth and May. 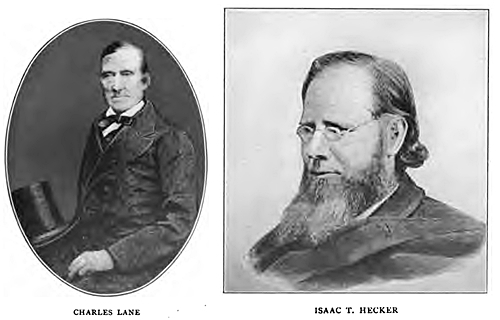 Charles Lane came with his young son William. 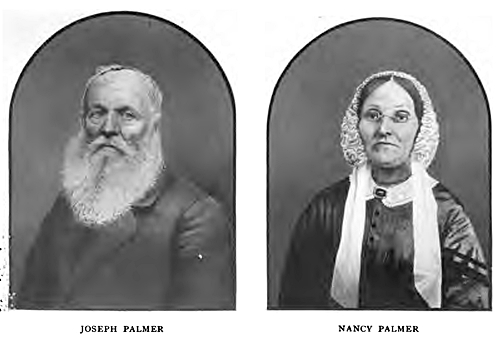 Other members of this “consociate” family were Joseph Palmer, Isaac Hecker, Samuel Larned, Abraham Everett (aka Abraham Woods or Wood Abraham) and Samuel Bower. The only other woman to join, Ann Page, came later. Clara Endicott Sears is the foundress of the now Fruitlands Musuem, having bought up the land in the early 1900s and written a book about the experiment, Bronson Alcott’s Fruitlands. 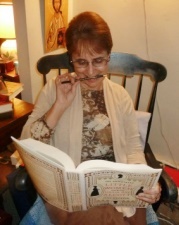 Her book is one of the few (if not the only one) that includes the journal writings of different members of the group beyond Alcott and Lane. It also includes Louisa’s take on the experiment, the satirical Transcendental Wild Oats, plus diary entries from Anna and Louisa during their time there. 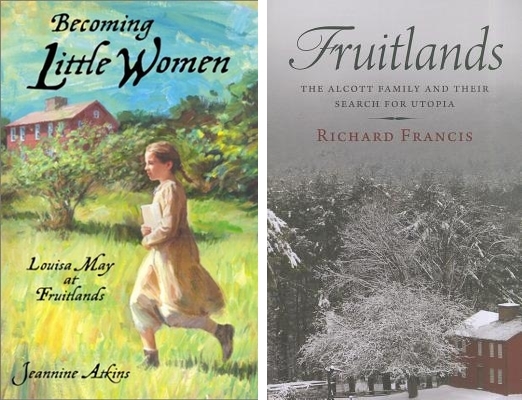 These books led to a young adult novel, Becoming Little Women: Louisa May at Fruitlands by Jeannine Atkins (see previous post) and finally Richard Francis’ tour de force, Fruitlands: The Alcott Family and Their Search for Utopia. This last book is densely packed with information and as a result, riddled with sticky notes which I still have to sort through. Eventually I will share what I learned from this marvelous book (see previous posts). “I felt sad because I have been cross to-day and did not mind Mother. I cried, and then I felt better …” (pg. 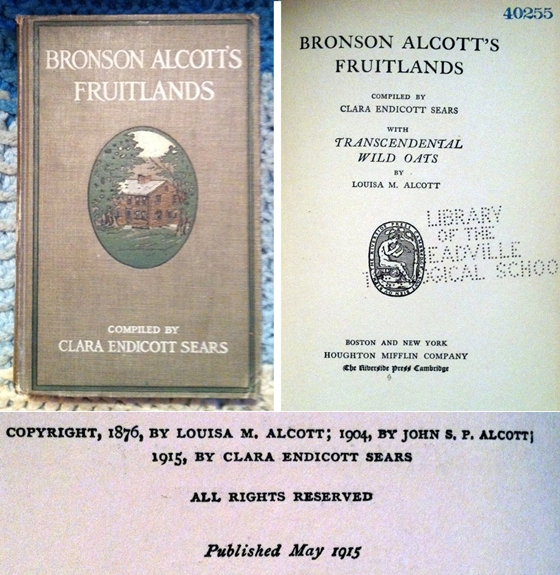 107, Bronson Alcott’s Fruitlands by Clara Endicott Sears). Louisa was not afraid to speak her mind and possibly earn the disfavor of her father; Anna however always wanted to please him. The girls would often pretend they were fairies or go berry picking. 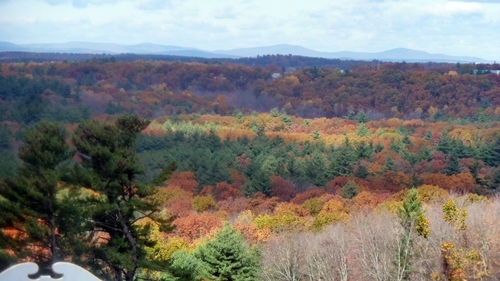 When the climate was agreeable, Fruitlands was a paradise (except perhaps for Abba who had to do the lion’s share of the work). Beautiful mountain vistas, rich forests, sparkling streams and long walks in the fields complemented the sense of warmth and community that Bronson and Charles Lane wanted to cultivate. Despite the rigors of living at Fruitlands (among other things a totally Vegan diet without the benefit of coffee, tea, sugar and butter; scratchy, lightweight linen for clothing so as not to rob the sheep of their wool or use cotton created by slave labor; sparse usage of animals for farming; strict rules and an over-abundance of “high-minded talk” along with an under-abundance of hand to the plow) and the difficult personalities involved, the community appeared to be thriving. Emerson was prophetic in his assessment of Fruitlands; when the temperature cooled and the snows came, life grew unbearably austere due to a lack of food, heat and warm clothing (although there was still an abundance of “high-minded talk”). One by one, the residents of Fruitlands abandoned the community leaving behind the destitute Alcotts, Charles Lane and his son. Eventually the property would be sold, Bronson and Charles Lane would part company, and the surviving family unit of Alcotts would be sorely tested. There is no doubt among Alcott biographers that Fruitlands was a very formative time in Louisa’s life. Nothing escaped the sensibilities of this ten year-old, most especially the burden of Fruitlands on her mother and the mounting tension between her parents which threatened separation. “About the time the grain was ready to house, some call of the Oversoul wafted all the men away. An easterly storm was coming up and the yellow stacks were sure to be ruined. Then Sister Hope [Abba] gathered her forces. 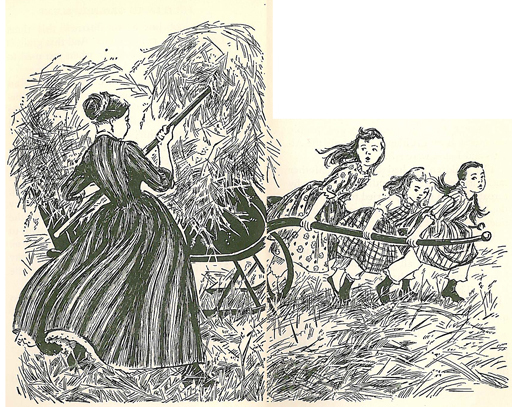 Three little girls, one boy (Timon’s son) [William, Charles Lane’s son], and herself, harnessed to clothes-baskets and Russia-linen sheets, were the only teams she could command; but with these poor appliances the indomitable woman got in the grain and saved food for her young, with the instinct and energy of a mother-bird with a brood of hungry nestlings to feed.” (Ibid, pgs. 166-167). 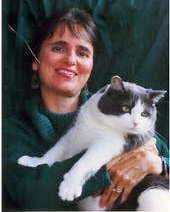 Louisa and her mother understood each other and leaned on each other. The daughter internalized the anxiety and frustration of the mother and watched as her father failed to provide, leading the family to the brink of starvation. Louisa witnessed the strength of her mother who eventually led the family away from Fruitlands to safety while the father collapsed emotionally (although Richard Francis in Fruitlands The Alcott Family and their Search for Utopia disputes this, claiming that Louisa invented or exaggerated her father’s response to the failure of the experiment to enhance the storyline of Transcendental Wild Oats – see page 259). I enclose a picture for you which I always liked very much, for I have imagined that you might be just such an industrious daughter & I such a feeble but loving mother, looking to your labor for my daily bread. Keep it for my sake, & your own, for you and I always like to be grouped together. The books laid for your reading, the vase of flowers fair. That you can rest dear mother, & I can cherish thee. It was a promise that would set Louisa on a course that not only achieved its goal but surpassed it beyond her wildest dreams. In the next post, I will share the impressions of some of the Fruitlands residents as detailed by Clara Endicott Sears. Thank you for sweeping us to this time and place, and I for one am glad your pictures are from a warmer time. Those journal extracts still touch my heart, and reinforce my sense, as do your words, that so much of who Louisa was developed at this time. 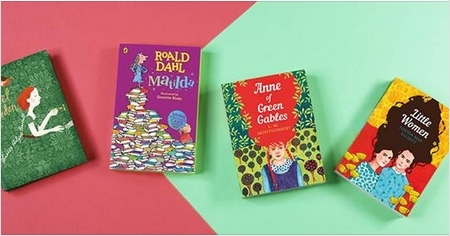 And thank you for mentioning Becoming Little Women! It gives me one extra nudge to get that book back in print this year. I look forward to your reflections on Clara Endicott Sears! Thanks. The first time I visited Fruitlands was about 3 years ago, before I immersed myself in Louisa again, and it was Sears that captured my imagination. 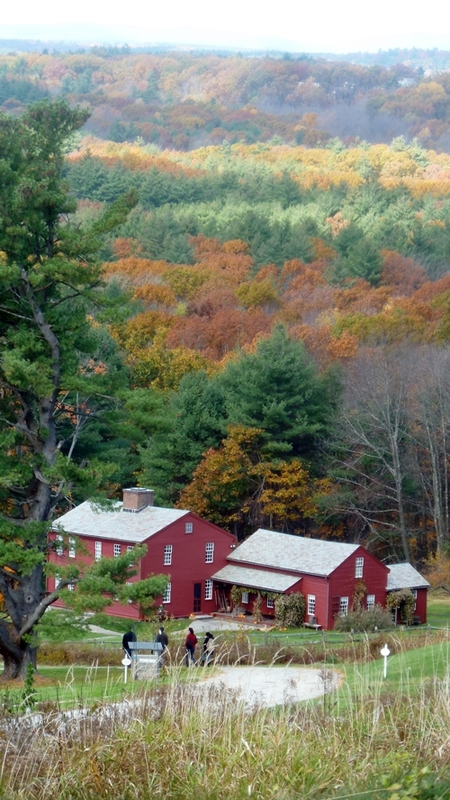 The Fruitlands Museum is so much more than Fruitlands. She has a house devoted to the Shakers who had an active community in the area during the time of Fruitlands and beyond, plus she has an extensive collection of paintings by New England artists and a museum devoted to Native American artifacts. 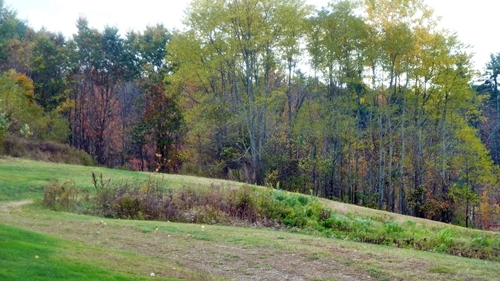 Fruitlands is a treasure thanks to a woman with a vision. Thank you for reminding me of my own visit to Fruitlands and also for the details from Richard Francis Fruitlands book.I need to read it. At present my understanding of the adventure is based on Louisa’s own words plus the account of Bronson’s collapse in Eden’s Outcasts. What a gorgeous setting — and an interesting and fascinating post. Thanks for sharing! Previous PostPrevious Just when you think there is nothing more to find … something is found!